Views - Will Poverty Always Be With Us? Will Poverty Always Be With Us? Spanning the world, permeating the life story in every culture, observable across every belief system (religious, social and political), you will be sure to find the poor. Whether the poor take the form of a starving child in Ethiopia, a beggar on the streets of Calcutta, a labourer in a sweat shop or a government subsidized shopper, cutting coupons at Walmart, it seems that in every society around the world, there are those who are better off and those who aren’t. Is this a sign of the times? Is it a product of capitalism? Are we making progress on this front? Were things as bad back then, when Jesus spoke about giving to the poor? Or, has poverty always been with us and we will never truly escape it? According to Wikipedia, "Poverty" is defined as an economic condition of lacking both money and basic necessities needed to live, such as food, water, utilities, and housing. There are many working definitions of "poverty", with considerable debate on how to best define the term. Confusion around the term is increased when titles such as destitution, absolute poverty, marginal poverty and relative poverty are also introduced. But for the purposes of this article, we will focus on absolute poverty or destitution as it has been used in reports and academia. The threshold at which “absolute poverty” is defined will in the majority of cases look and feel the same from one territory to the next. It will be a complete lack of access to nutrition (food), clothing, clean drinking water, sanitation and shelter. Absolute poverty refers to a set standard which is consistent over time and between countries. In 1990 the poverty line was set at 1 US Dollars per day. In 2008 the World Bank adjusted this upwards to $1.25 to account for inflation and in October 2015, it was similarly reset to $1.90 a day. Just imagine for a moment surviving on that amount per day. Life under that line would be unimaginably difficult, fraught with uncertainty and desperation. Our World in Data has done an excellent job in illustrating this point through a series of slides that make up the presentation, "The Visual History of World Poverty". In it economist, Max Roser starts with the illustration provided below and shows seven slides tracking the history of poverty since year 1 AD right up until 2008. Here, we show the first and last slides of the series. Using 1990 US Dollars as the constant, it is clear that for much of human history, people were poor. We know that the standard of living was very low in comparison to modern times (especially the last 100 years) where developments in transportation, science, medicine and provision of utilities have exploded. The simple answer is yes, at least where absolute poverty is concerned. The share of the world’s population living in absolute poverty has fallen from approximately 90% in 1820, to 43% in 1981, to 14% in 2011. Over the 30-year period from 1981-2011, the estimated number of people living in absolute poverty fell from 1.95 billion to 1.01 billion. Today the World Poverty Clock (set up to monitor the progress toward the UN’s goal of eradicating absolute poverty by 2030) estimates that 643.3 million people are still living under the $1.90 per day poverty line. Current projections from the organisation point to 6% of people living below the poverty line in 2030, or over 400 million people in absolute terms. At our current rate of improvement, it will still take over a hundred years to eliminate absolute poverty and then we would still have an enormous task ahead of us to tackle unemployment, lack of education, and provision of a living wage. In many ways, there are two conversations being had. One is focused on bringing a huge number of people over the poverty line and the other conversation is aimed at inequality or unequal distribution of wealth. 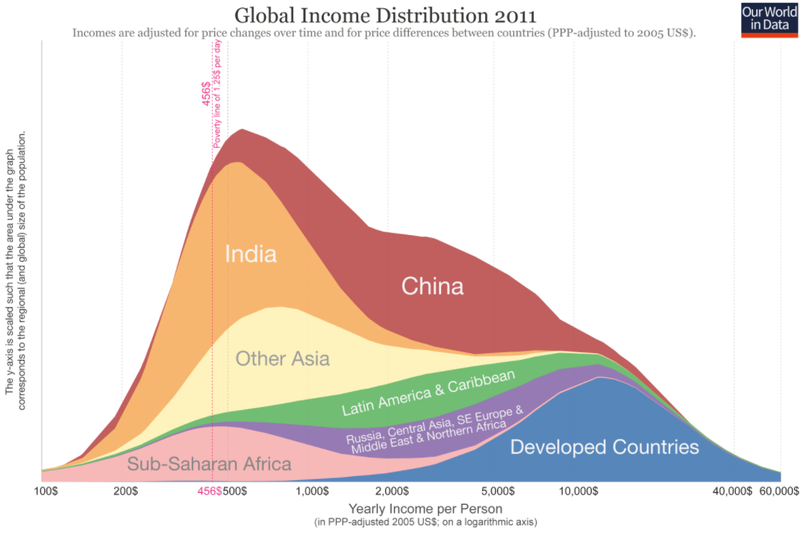 Today, the poorer half of humanity earns less than 3% of the global household income. If only 3% of the 97% enjoyed by the wealthier half of the world’s population were to be transferred to the poorer half, it would double their income overnight. In a world where we are told to dream big and earn even bigger, it comes as a sobering reminder that many of us are far better off than the majority of our neighbours, and a timely reminder that we are in a far better place wealth-wise than our ancestors. The views and opinions (where expressed) in this article are those of the author and do not necessarily reflect the official policy or position of Discovery Invest. The information contained in this article is for informational purposes only and must not be regarded as a prospectus for any security, financial product or transaction. It is neither to be construed as financial advice nor to be regarded as a definitive analysis of any financial issue. Investors should consider this research/article as only a single factor in making their investment decision. We recommend you consult a financial planner/advisor to take into account your particular investment objectives, financial situation and individual needs. The views and opinions (where expressed) in this article are those of the author and do not necessarily reflect the official policy or position of Sharenet. Your feedback is appreciated and helps us improve our content. Thank you for helping us improve our content.